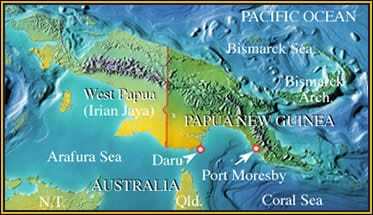 Location: Western Province, southwestern Papua New Guinea. Mark and monitor lizard expert Dr Robert Sprackland are on the trail of a lizard which grows longer than the Komodo dragon, Varanus komodoensis. A giant of a lizard with unusual Tyranosaurus rex-like teeth and amazing tree-climbing abilities, Salvador’s monitor lizard, or the ‘tree crocodile’ as it is known locally, is a much feared creature which reputedly leaps down from the trees and to kill pigs, deer and even valuable hunting dogs. Despite several visits to Papua New Guinea (PNG) Mark has only met with a pair of tree crocodiles and they were captive specimens at a crocodile farm. He and Robert are keen to try and capture and examine a truly wild specimen of one of the largest but least known lizards in the world. With the help of expert Papuan trackers and hunters, led by a charismatic headman, they search the expansive savanna woodlands and crocodile infested water ways of the Binaturi, Bensbach and Fly River systems. En route Mark knows there are many opportunities to find other fascinating and rare reptiles because he and Robert are visiting the remote and little explored Western Province of PNG, near the West Papuan (formerly Irian Jayan) border. Mark has seen all of New Guinea’s python species except the Water python found on these seasonally flooded southern savannas, but even Mark was not expecting to find the confusing species he encounters here. 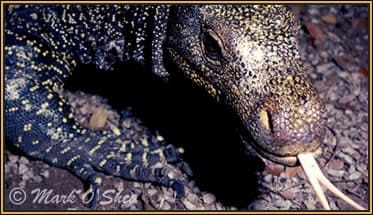 Salvador’s monitor lizard, (Varanus salvadori), has a long, forked chemo-sensory snake-like tongue as do all monitor lizards.